The emblem of Scotland is beautifully showcased in this stunning pendant meticulously hand crafted in our studio. 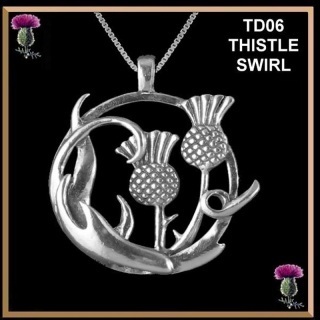 This elegant circular design encompasses the swirling thistles, a delight from every angle. A real show stopper! Measurement: 1-3/8" in length by 1" in width (35mm x 25mm). Exquisitely handmade from sterling silver and includes an 18" Italian box link chain. Exquisitely handmade from 10K gold. 18" gold chain is an extra charge.